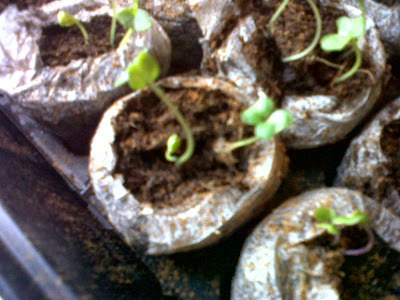 In March, I planted my seeds indoors using these little peat pods. They are small disks of soil material covered in this fabric material. You soak them in water and they grow three or four times their size. It's sort of fun to watch. I thought it was a great idea. And perhaps it is for some people. But I can promise you that I will not be buying them again next year. When I pull out my plants, this is what I am finding every single time. Those things do not break down. Or at least not in the time frame I've been using them (started using March 01, planted in the ground May 31). Clearly the roots are growing through them, which is good. But I am wondering if it perhaps stunted the growth some. Plus the fact that they are in perfect shape and could be used again concerns me. They were supposed to break down and compost. Even the soil material is in place and did not mix into the real soil in the ground. Lilly Pulitzer Blackberry case doubling as a photo background! So I know it's not earth shattering to most but I am adding this to the long list of lessons this year. I'll just use a potting soil mix next year. Do you use these little peat pods for your seed starting? Have you also found that they don't break down into compost? Or did you have better luck with them? I always just use potting soil as I plant all my in planters anyway...I would guess if it has to work that hard to branch out of the pod that it definitely stunted it in some way. This is a little late, but I felt worth mentioning. I'm not sure what others do but I like to cut off the netting right before the seedlings are potted up. It gets chucked into the compost bin where it can decompose at its leisure.